A chain of three German hospitals, the Agaplesion Frankfurter Diakonie Kliniken, wants to use drones to transport blood and lab samples. Circa 50 to 70 times per year, blood must be quickly delivered from the central blood bank and laboratory to one of the chain’s three hospitals as part of an emergency situation. However, due to typical Frankfurt rush hour traffic, it can take up to 20 minutes for a 5 km (3.1 mile) trip. An unmanned aerial vehicle (UAV) could potentially do the same trip in 5 minutes. German and EU laws require that drones remain in view of their pilots at all times and prohibit flight over densely populated areas. Drones may also not fly higher than 100 meters (328 feet). As such, test flights for the unmanned drone delivery of blood and laboratory sample have only occurred on private land but the maiden flight over the Frankfurt cityscape is still pending. All-weather, 4.5 kg (9.9 lb), six-rotor UAV with three-dimensional locating and positioning capabilities via onboard camera, GPS and air pressure sensors. In case of emergency maneuvers, the drone can return itself to predetermined flight corridors. Should engine problems or a low battery situation occur, the UAV can autonomously fly back to its starting point and land without pilot assistance. Up to 0.5 kg (1.1 lb) via small thermally insulated containers. Approximately 15 km (9.3 miles). Up to 70 km/hr (43 mi/hr). What are your thoughts on the use of unmanned cargo delivery drones for blood transport? Comment below! 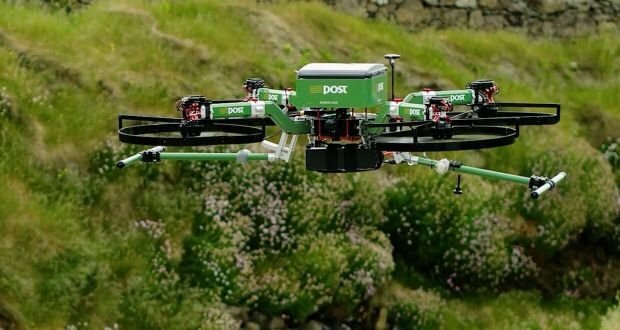 The Rwandan government has signed a deal with a US company to deploy the first ever autonomous system in the world for delivering blood bags for emergency transfusions via drones.